This is my son, Caden. He's the type of 9 year old boy that likes anything super scary & unique. Although, this idea may not be appropriate for some kids his age. The total cost of the look was about $13.00. For anyone that doesn't already own normal women's makeup, it'll run a bit higher though. You start with a large-toothed zipper from any craft store, you'll want to choose one with fabric that matches your skin color best. You'll also need liquid latex- we bought ours from a local Halloween store but most often it's more easily found online. Finally, you'll need deep red lipstick, tissue or toilet paper (we used tissue paper), foundation, black or dark brown eyeliner, and fake blood. You cut the zipper to the length you'll need to cover your face & neck. You'll also want to cut away some of the fabric on the sides of the zipper to avoid a fake, bubbly look. Apply the liquid latex to the area you'll attach the zipper & to the back of the zipper- then press onto the skin & hold until dry. Then using more of the liquid latex, smooth a bit more along the outside of the zipper to fully secure it. While it's drying you can begin on the gory part! We first coated the "exposed" area with the red lipstick, then added a very thin layer of liquid latex over the red & stuck tiny bits of red tissue paper on it to give it a torn, peeling effect. Then, just inside the open area of the zipper we added the black eyeliner & blended it a little bit with our fingers. Next we went back to the outside area of the zipper with foundation & blended it outward to give it a more natural look. 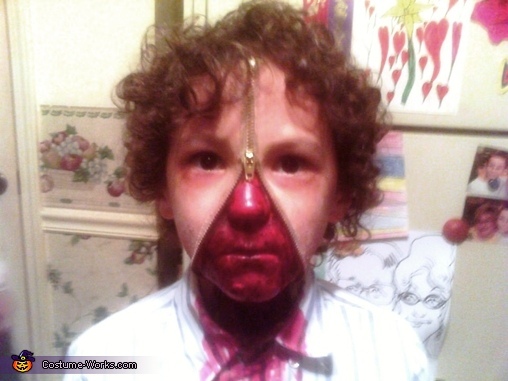 Finally, we drizzled fake blood over the nose, mouth & neck for a wet, icky effect. Caden received countless compliments & even had his picture taken at many of the houses we visited. What an amazing makeup job! Love this! Outstanding Job, maybe we have a New Master Of Horror. Very Cool, Good Luck..... So creative, I LOVE it!!!! That is one of the most awesome costume I've seen :-) I love it. Too bad we don't celebrate Halloween here in France. That sure is awesom!!! Good job!! Very cool! You deserve to win!